Chia Seeds might be small, but they pack a serious health punch. Not to mention, they can be used in a variety of sweet and savoury dishes. This is what makes Chia Seeds so special, proving that good things come in small packages. Chia Seeds may be strong, but they are filled with nutrients. One serving of Chia Seeds has 18% of your recommended daily calcium intake. One ounce (two tablespoons) of Chia Seeds contains roughly 40% of the adult daily recommended serving, which is key to healthy digestive health. Fibre has many roles, among them aiding in weight management since it makes you feel full for longer by slowing the absorption of food in the body, making you consume fewer calories. 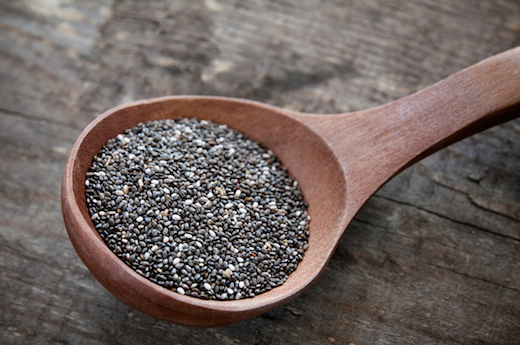 Chia Seeds are high in Omega 3 Fatty Acids – they have eight times more Omega-3’s than salmon! – making them anti-inflammatory and helpful for brain and heat function. Protein is essential for a healthy diet. Chia seeds are a good source of vegan protein. Antioxidants in food help neutralize free radicals in the body, preventing cell damage that can lead to pre-mature aging and diseases such as cancer. Chia seeds help stabilize blood sugar, which prevents insulin spikes after eating. This can help with weight management and minimize belly fat. Because of the high amount of fibre, protein, and carbs, chia seeds will keep you feeling fuller, longer. Chia seeds are also gluten free. Chia seeds can be added to your diet in many different ways. They can be baked into breads and pastries and added to drinks for additional health benefits. When added to liquid, chia seeds “bloom” to create a dense gel. This is useful in recipes and makes them a good replacement for eggs in vegan cooking, or for creating simple, delicious and healthy raw pudding recipes. 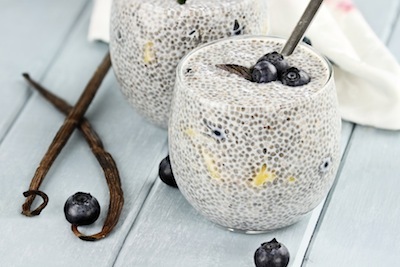 Here is a great recipe for simple Chia Seed Pudding.